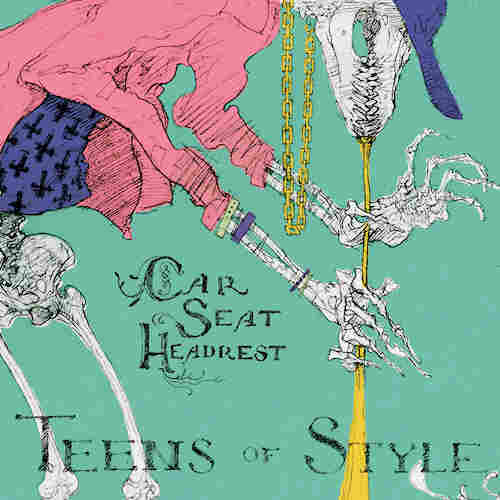 Review: Car Seat Headrest, 'Teens Of Style' Will Toledo makes smart guitar-pop music for loners and weirdos. Teens Of Style reworks 11 songs from the self-aware 22-year-old's already-vast catalog. "All of my friends are getting married / All my friends are right with God / All of my friends are making money / But art gets what it wants and art gets what it deserves." Will Toledo makes smart guitar-pop music for loners and weirdos who can't help but overshare their loneliness and weirdness with the world. Those opening lines to the moody and slightly funky "Times To Die" are the closest thing to a raison d'être for Toledo and his Car Seat Headrest moniker. The 22-year-old is openly self-aware, yet his writing is universal in the way it captures boredom, lovesickness and anxiety. There's also an implied "whatever" in there somewhere, but not because he doesn't care — if anything, Toledo probably cares too much and can't help but let it all hang out in a string of clever one-liners and introspective metaphors blown wide-open. Since 2010, Car Seat Headrest has self-released 11 albums on Bandcamp, amassing followers the new old-fashioned way, by tweet-of-mouth. Toledo's early teenage experiments — earning that name by recording vocals in the back of the family car in Virginia — are rough, but quickly followed by a string of wild and imaginative albums, including 2010's My Back Is Killing Me Baby, 2012's Monomania and 2014's How To Leave Town. Like one of those '60s underground psych/garage-rock Nuggets comps squeezed into a GarageBand file, his work reflects a voracious musical appetite that follows the spirographic lines of Beck and Guided By Voices without falling into the traps of style worship. For those not ready to plunge into a sprawling catalog, Teens Of Style offers a helpful introduction to Car Seat Headrest that reworks 11 songs from Toledo's short yet already prolific career. Toledo is joined by bandmates Jacob Bloom (bass) and Andrew Katz (drums) in his new Seattle home to turn these home-recorded explorations into full-spectrum, heart-pounding psych-pop songs. The most dramatic entries are the ones that always played out larger than they were, like the languid rocker "The Drum," now rounded out in low-end fuzz to complement the spinning-top rhythm. The four-on-the-floor power-pop song "Something Soon" also benefits from Katz's clean-cut drumming and a warm Rhodes keyboard and does the thing the original couldn't: release the youthful restlessness of Toledo's desperate yelp ("Heavy boots on my throat / I need something soon") amid a Technicolor wash of overdriven guitars and distorted Beach Boys harmonies. Normally, when an artist reworks his or her past material, the result is an overproduced mess, but Toledo's still living these songs, and his new band finds other ways in. He does, however, tinker with the referential lyrics here and there, most notably imbuing a Biblical metaphor with an homage to his new Matador Records boss ("Got to have faith in the one above me / Got to believe that Lombardi loves me"). But his odes to W.B. Yeats (the Phil Spector-esque "Maud Gone," complete with sax solo) and Raymond Carver ("Something Soon") remain lyrically intact, as does the Diego Velázquez-inspired "Los Borrachos (I Don't Have Any Hope Left, But The Weather Is Nice)," which includes this cunning couplet of Greek soap opera: "Stop burrowing through old chocolate boxes / Like a heartbroken Bacchus." Teens Of Style doesn't include any of Car Seat Headrest's 10-minute epics, the ones that hint at something outwardly grander, but it does capture the compact symphonies bouncing around Toledo's brain. It's a strong stepping stone to next year's Teens Of Denial, on which Car Seat Headrest will move from the bedroom to the studio.